Lucknow: The Lucknow Metro Rail Corporation (LMRC), a joint venture of the Government of India and the Government of Uttar Pradesh, which has set a new example of excellence in the Mass Rapid Transit System of India, will celebrate its first anniversary on 5th September 2018. The LMRC shall be organizing this occasion as ‘Lucknow Metro Diwas’ dedicating this day to the Lucknowites. The Chief Guest of this event will be state’s Chief Minister Honorable Shri Yogi Adityanath. Many other dignitaries from Central and State Government will also be present on the occasion. In addition, Dr. E. Sreedharan, Principal Advisor, LMRC will also extend the dignity of the celebration with his presence. On this occasion, various programs will be organized on behalf of Lucknow Metro, through which the people of Lucknow will be made aware of the unprecedented and successful journey of Lucknow Metro. The celebration will start in Metro depot located at the Transport Nagar with the welcome of Honorable Chief Minister on 5th September 2018. After the reception, the Hon’ble Chief Minister will visit the Metro exhibition. The ‘Lucknow Metro Diwas’ will be inaugurated in the newly constructed auditorium located inside the Center of Excellence for Training building by the Hon’ble Chief Minister with Shri Kumar Keshav, Managing Director, Lucknow Metro delivering the inaugural speech. Prizes will also be distributed for best performances in various fields. MD’s Gold Medal and MD’s Silver Medal will be awarded to the best employees associated with Metro Projects and Metro Operations. In addition, the best-maintained metro station will also be awarded the ‘Best Kept Metro Station’ award by the Managing Director. After this, the ‘Mascot’ of Lucknow Metro will be inaugurated by the Hon’ble Chief Minister followed by the launching of ‘Metro App’ by him. The LMRC will also showcase an exhibition for the public at the Charbagh Metro station where Lucknowites will become familiar with the Lucknow Metro’s journey and achievements so far. To mark the occasion, students from the prestigious schools and colleges of the city will showcase their art through rangoli and various cultural performances. The Lucknow Metro’s in-house Musical Band will also give its first special performance on this special day. In the first year of its operations, the Lucknow Metro has added 34.5 lakh passengers with its journey. Significantly, this figure is more than the total population of Lucknow. During this year, Lucknow Metro has successfully achieved the objective of ‘Zero Accident’, says Shri Kumar Keshav, Managing Director/LMRC. The Metro trains have traveled 6.8 lakh kilometers, which is equal to the distance of 17 rounds around the earth. The Transport Nagar Metro Depot spread over 42 acres, is the fastest constructed Metro depot in India which has been completed in a record time of just of 15 months. LMRC is the first metro in the world to have a camera at the roof for continuous pantograph and overhead wire monitoring. The CCTV images of the moving metro train interior are continuously streamed from the centralized control room in Depot. 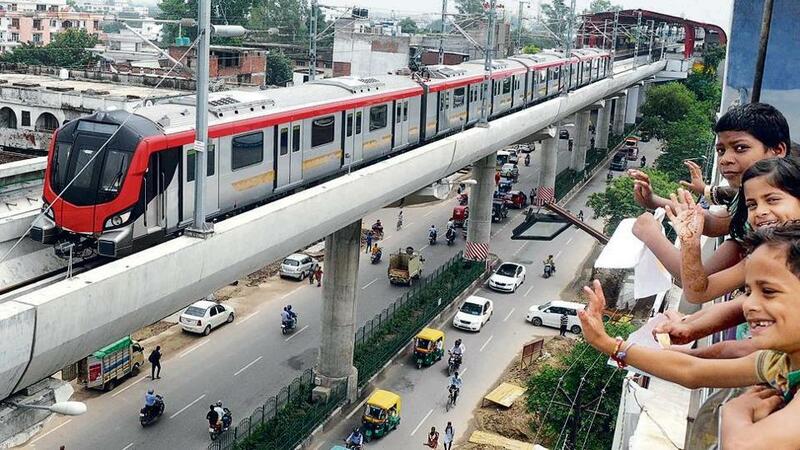 The Lucknow Metro’s ‘Priority Section’ (from Transport Nagar to Charbagh Metro station) has been completed and commissioned for public services in just less than three years. It is, therefore, the fastest metro project which has ever been implemented in the country. In addition to completing the work in record time, LMRC has also set up an ideal record for quality of construction work and safety. There is a long list of exceptional achievements in this regard for LMRC. 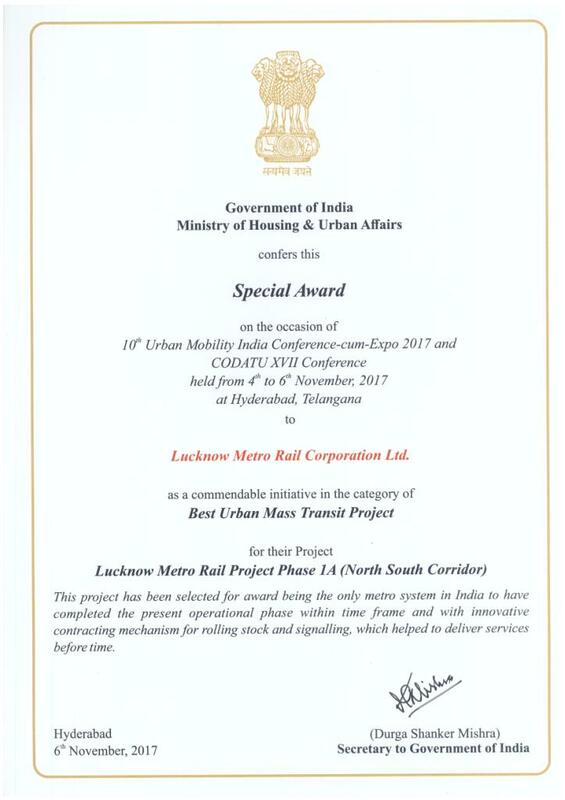 The Lucknow Metro has been awarded the International British ‘Royal Society for the Prevention of Accidents (RoSPA)’ Award 2018, ‘Technology Sabha Award’ (2018), ‘Best Urban Mass Transit Special Award’ (2017), ‘International European Society for Quality Research (ESQR) Choice Prize’ ( 2016), ‘International Quality Summit Award’ (2016), Best Metro Project for ‘Excellence in Innovative Designs’ (2016), ‘Dr. APJ Abdul Kalam Memorial Award’ (2016), and many other prestigious national & international awards. 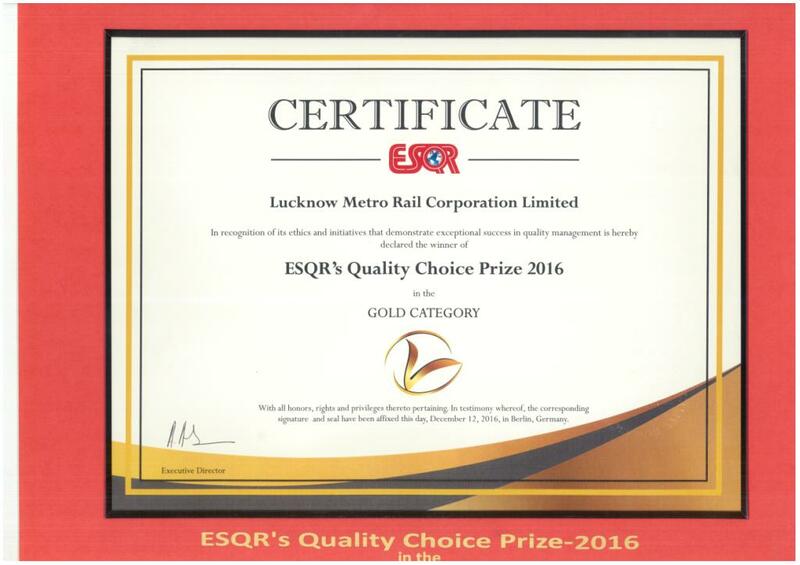 Lucknow Metro is ISO 14001: 2015 and OHSAS 18001: 2007 certified organization. Whenever the need arises, Lucknow Metro has always performed its duty for the welfare of society. Lucknow Metro organizes special camps in collaboration with NGOs. LMRC also organizes health camps for the school children of the economically weak section. Recently, in collaboration with NGO GOONJ, LMRC recorded its participation in the Kerala flood relief campaign and organized a three-day relief collection camp. The “Lucknow Metro has been organizing various programme from time to time with an aim of empowering women and children in society. Along with organizing programs like ‘Raat ka Ujala’ (Tribute to Nirbhaya) and Power Angels-1090, Lucknow Metro also organized a special visit programme for the members of the Para-Sports Players”, says Shri Kumar Keshav, Managing Director/LMRC. 50% of the trains of Lucknow Metro is operated by women train operators. Braille stickers have been installed at Metro Station for physically handicapped commuters. Long stop push special buttons have also been arranged for longer stoppage of a train near the wheelchair space in Metro train. “Travelers often forget their valuables in the metro station or around it, but due to alert metro staff, passengers get their luggage back safely. In the last one year, a cash amount of about Rs 47,000 has been returned to the Metro passengers. On an average, one laptop is returned by LMRC to its rightful owner every month while one mobile is returned to Metro commuters every week and one purse or bag is returned to the passengers every third day. On the humanitarian front, three persons are helped/assisted on medical grounds every month on an average by LMRC personnel or security personnel”, says the Managing Director.